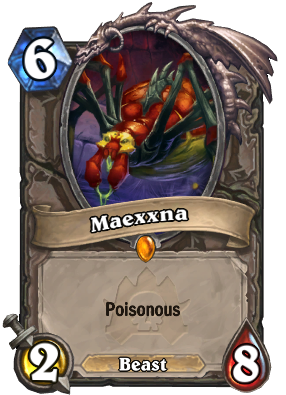 Maexxna was added in the Curse of Naxxramas Adventure. She is available from Wing 1 - The Arachnid Quarter which opened on July 22nd, 2014, and is obtained after defeating the adventure boss Maexxna. Need help conquering the Curse of Naxxramas Adventure to obtain Maexxna? Head on over to our Curse of Naxxramas Adventure Guide! ... and then came The Boogeymonster! But now you can use it to beat the lich king as paladin if you are extremely lucky, gg best card. Or does it? If it has 8 attack then poison isn't really needed so you could probably find better minions for that. So, how many of you will be disenchanting this one when Standard hits? Nah, Maexxna is the only Deathtouch creature with high health. If they print in future sets strong high health, low attack utility creatures, this might become relevant in Wild. There could also be other cards that make Maexxna relevant. Devastatingly weak against Priests. Can be hit by Shadow Word: Pain or worse, Cabal Shadow Priest. Vulnerable to Stampeding Kodo but you usually don't see those in constructed. Can trade favorably for bigger minions... sometimes... but the things big enough to be worth hitting usually will either kill Maexxna or reduce her to range of a ping hero power. If she can't often go 2 for 1, the inability to go face very well just makes her a worse Boulderfist Ogre. The dream is to hit Ysera or Malygos but that never goes favorably. Most of the time, Malygos is played to get lethal right away, so being able to attack into it favorably is useless. As for Ysera, if Ysera is played first, responding with Maexxna gives your opponent an extra Dream Card (which isn't good at all), but if Maexxna is played first then your opponent will simply hold off on Ysera until after Maexxna's off the field. Cabal Shadow Priest likes this card. Value from Webspinner especially in mid range hunter. As a priest I notice the 8 toughness and that she will always get her man, like the emperor cobra. That is, barring any shenanigans with the cabal shadow priest or the kodo. Seems rock solid and a great addition to priest decks everywhere. Could this be a good card in Control Paladin? I've found this card increadebly useful in tempo Rogue decks.